With a multicultural neighborhood like ours here in Dubai, we get to celebrate all sorts of festivals. The Hindus celebrate the beginning of spring with Holi, the festival of colors. People throw colored water at each other. The majority of my kids' friends are Indians. So we were invited to a kids' Holi. Honestly, I had no clue what I was in for. Especially the "long term effects" of colored water being squirted at my two blonde kids were undeniable. Something that could not be seen on their Indian friends. But I had two pink-haired children for almost a week until it finally washed off. Spring, otherwise, didn't do us much good so far. A constant change in weather from cold to warm and back is making us sniff and cough and it just doesn't seem to go away. The sound of sniffing noses is driving me mad by now, probably aggravated by being less patient due to my own little cold attacks. Chicken soup is what is supposed to help in this case. I felt that an extra portion of chili with the soup would help chase those nasty bugs out of my system. 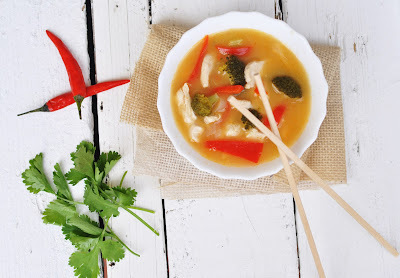 I made this Thai Chicken Soup that took me less than 30 minutes. Indeed, it ticked all the boxes that I expected when making it: a soothing chicken soup, with a refreshing hint of lemongrass to awaken my weak and tired body while the chili cleared my blocked nasal passages. Brightly colored veggies added the crunch and some extra vitamins to it. This soup is surely invigorating and a very pretty dish to serve. In a pan and over medium heat, bring chicken stock and coconut to a boil. Let simmer for 5 minutes, then add fresh chili, ginger, lemongrass and curry paste. Simmer for another 5 minutes. Add chicken, bell pepper, broccoli and spring onions. Cook for 10 minutes. Season with a tablespoon of lime juice and garnish with fresh cilantro. Ready to serve.